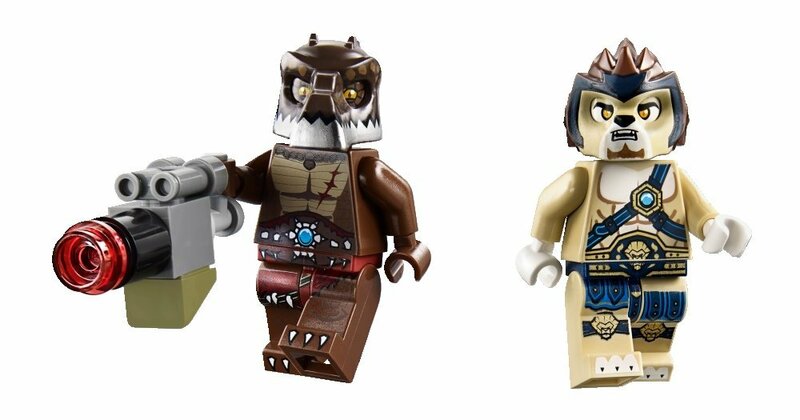 Attention everyone: LEGO Legends of Chima toys, the new animal/beast figures set to replace Ninjago, are at some (if not more than some) Toys R Us stores now. Each set has one or more bird, lion, gator, or other creature figure and a number of bricks. The carded mini sets are around $16.99 locally, higher than anticipated. (Target is expected to charge $14.99.) But the good news for you is that they might be out, so get looking! Good hunting, and Happy 2013 Toy Reset to you! 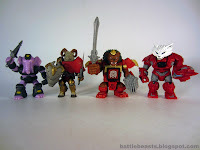 Battle Beasts Minimates - Packaged Photos, Anyone? 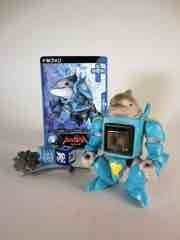 Over on Diamond's Facebook page, find a bunch of packaged shots of the Battle Beasts Minimates. These are the comic shop versions, which have different deco (and 2 unique characters) compared to the Toys R Us release. Also, the Facebook feed made mention of a January release - so you haven't missed them, they're coming real soon now! 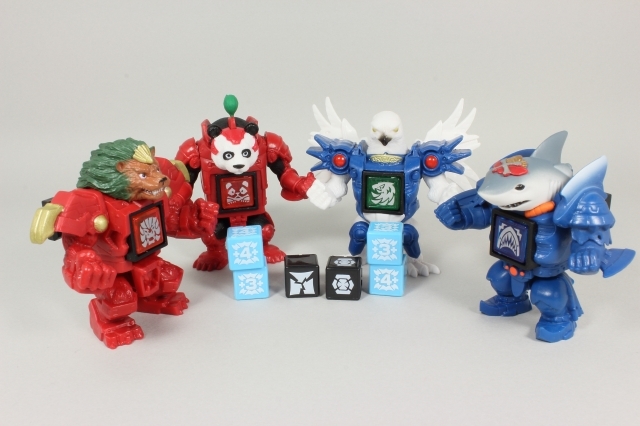 A Japanese toy blog has pictures of the Beast Saga Capsule (Gachagacha) toys. I'm looking where I can get a set of these (if you have a cheap lead, do share) but I would like to point out that this blog post shows how they're different. They're roughly the same size as the standard figures (maybe a hair smaller), but the arms seem to be unjointed. No weapons are included, but Liorga's head has a closed mouth and the bird seems to be unique (and exclusive) to this grouping. More as I have it! And heck, hopefully we'll all have them soon. Since I can't read Japanese and there aren't many fan sites yet, the Beast Saga name I see for the elephant is Eredoramu. So let's go with that. 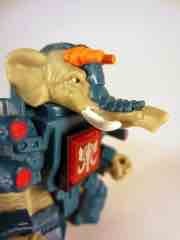 A distant cousin of Sledgehammer Elephant of Battle Beasts fame, this new guy has tons of sculpted personality but loses the nifty, dedicated arm weapon. 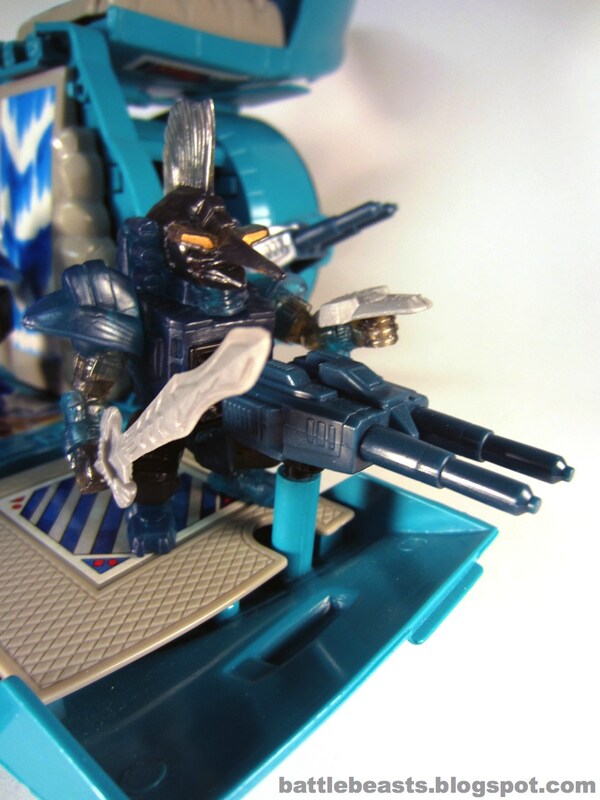 Oddly, it has an upgrade lance/spear weapon similar to the old 1980s toy, which I don't think is a coincidence. The good news! You can still get the Stealth Armorvor MK II right now for just $8! The new gold one is already gone, but hey, get while the getting is good for the clear here. It's pretty great. I have the MK I and it's fantastic. Check the Onell Design Store for the latest availability. 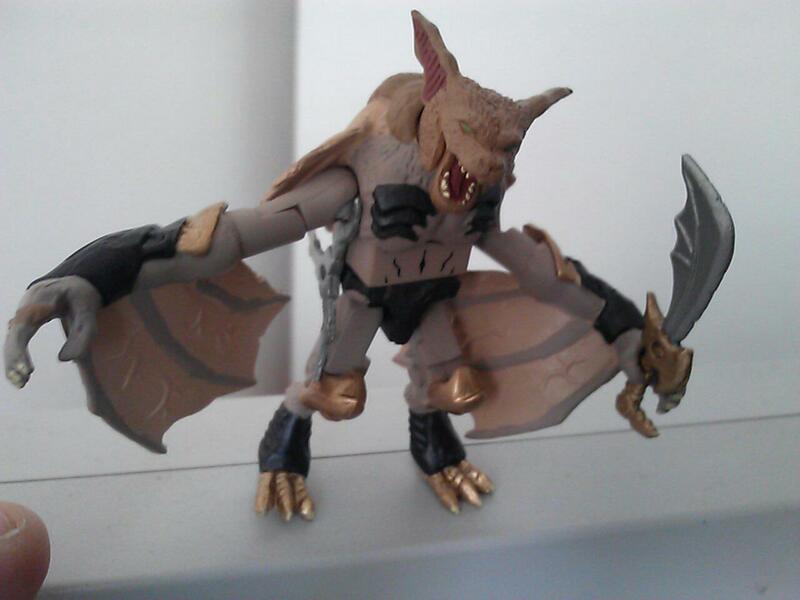 The first wave of Beast Saga can probably put Dorfan (if that is his real name) as the single-carded winner. This is the one that seemed to show up on Japanese blogs and photo sites the most in those early days, with lots of customs, tributes, and galleries focusing on what we all call the dolphin. Heck, they probably do too, as "Dorfan" is just one name I saw around and I have no idea if this is really the character name. It's pretty dopey if it is. The second wave of Beast Saga hit in October with not too many new figures, Arudairu joined Garrison G and a Kingdom of the Sky 3-Pack to add 5 more to the growing army of battling beasts. I daresay this is a good batch, with this figure being one of the big highlights of the entire line so far. This one presoldout quickly online and doesn't seem too easy to get. It might be $15 or so on eBay, which is a lot, but it's pretty much worth it. Beast Saga Card Translation Notes, Seahorse En Route? There's a thread on the October Toys Forums in which they translate one of the Beast Saga TCG cards, which is pretty handy and telling. Killer Shark's translated bio and turn-ons/turn-offs are present, and here's the fun thing: it turns out the little gold coins on the bottom of the cards are a sort of a peer review, it's another character commenting on the figure in question. Thanks to our pal Seth for the heads-up! So when shooting the Turtle figure for a future review, I couldn't help but notice one had a fairly nasty looking seahorse on the back which, at this time, we haven't heard of from Takara-Tomy. Most of the little coins show existing characters, but a few, like this one, we haven't seen yet. We should have some more news for ya soon. 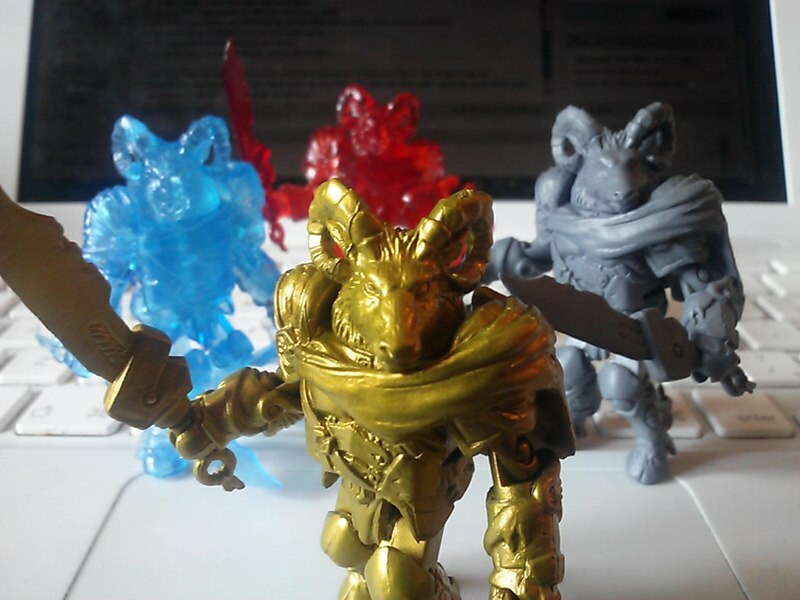 December is expected to be a good month for battling beast figures. 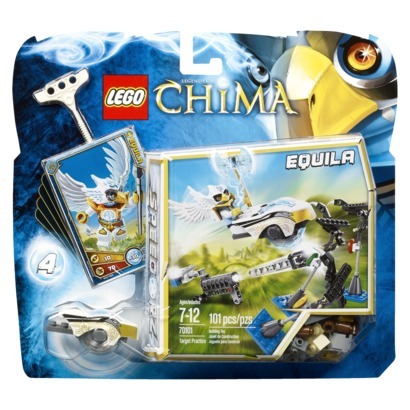 What's new for Legends of Chima? Brickshelf put up an amazing gallery of new toys which are probably going to start showing up in a store near you at the time I finish typing this sentence. 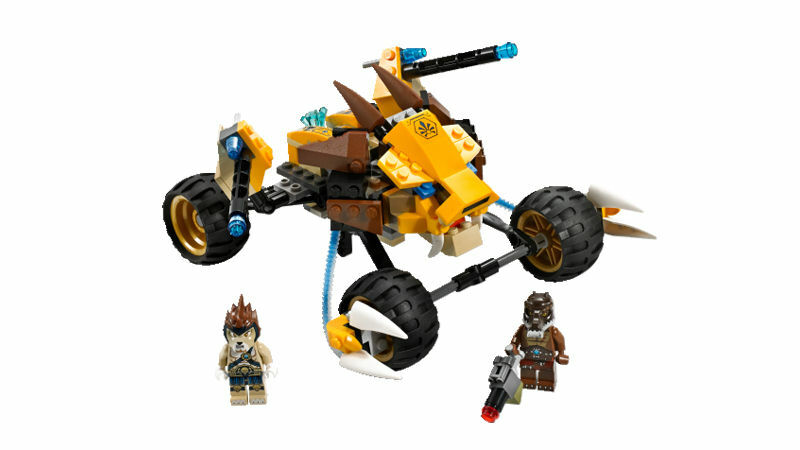 Each set includes one or more beast figures, weapons, and a nifty vehicle. The biggest boat in the line even includes one of the new, fancy brick separators. You can see 9 sets in the Brickshelf gallery including some pretty decent close-ups of the figures. 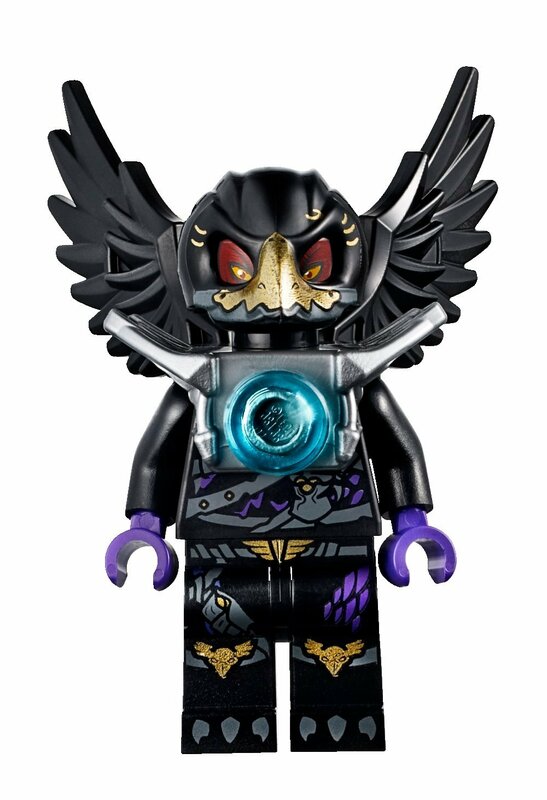 As the follow-up to Ninjago it looks pretty decent! Of all the new Beast-esque lines, this is the one that'll probably get the most marketing dollars and distribution. While the "Sea Death" set is the gem of the launch window, there's no denying that the Kingdom of Gloria action figure set is worth a look as well. Raioga the Lion has unique accessories in this set, and he's joined by Jidam the Hamster and Big Serow the Deer. As with the single figures, they have shields, melee weapons, dice, and trading cards. 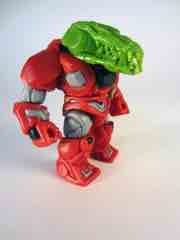 Each figure has 4 points of articulation and is made of a soft, rubbery plastic. Since the figures have closed fists, getting the weapons in there can be a tight fit. Each figure has a hard plastic die launcher in their chest which has a swell light-piping effect making use of clear plastic and a tiny prism. Television: where no beast has gone before! 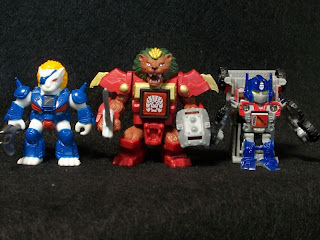 While the original Battle Beasts got cameos on Transformers: Headmasters and a few TV spots, there were no cartoons for any of these guys or their descendants until now! 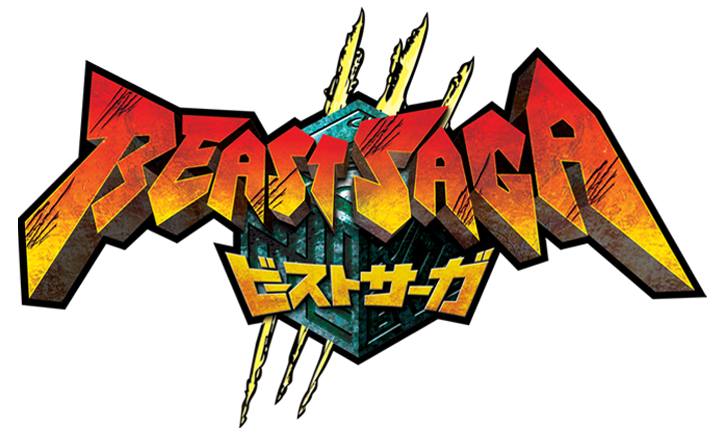 Japanese TV will begin airing Beast Saga as a cartoon for you anime fans starting in January 2013. The site is in Japanese and has no active links yet, but hey, there it is. I'm sure someone will have it streaming somewhere, somehow, soon into the new year. The Armorvor Aurustell Elite is coming Friday! 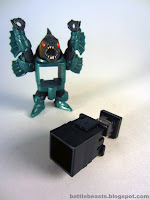 For $8, it'll likely sell out pretty quickly I suggest you read the Glyos Transmissions Web Log and cross your fingers the Toy Gods shine a ray of mercy on your beast-collecting soul. The third Armorvor to sell out is the clear, unpainted, colorless Stealth Armorvor. While I personally am not too keen on clear figures, Onell Design seems to have a plastic that really shines if lit properly. I haven't seen a lot of discoloration either, so it's (so far, at least) easy to see this as quality stuff. 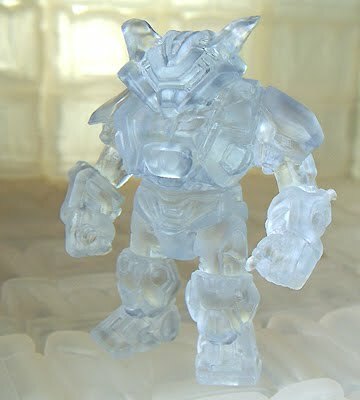 Many fans buy clear figures not to keep, but to customize by dying them red or green or some other color and you can find some really spiffy designs on the October Toys Forums and elsewhere. If you're anything like me, this is the moment you've been waiting for! This is as close as the Battle Beasts Minimates will be to the mass market this year, and not only do they look great, but for the first time that I've seen - they have names! Check out this awesome group shot. Individual 2-pack pics, information, and names are after the cut. (It's a lot of stuff.) I hope you're excited... because MOOSE. While initial solicitations seemed to indicate the assortment of Beast Saga figures would include unique and new sculpts, this was a lie. 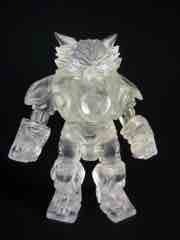 So those of us who preordered a case got figures like Dolphin Burst, a clear redeco of a pretty solid design. Almost completely devoid of paint (save for the eyes and dice), the Dolphin Burst seems to be cast in a mix of clear blue and milky white plastics to give it an appearance that's quite unlike anything I've seen as of late. "Clear white" or "milky white" is pretty uncommon in toys, and this 2 1/3-inch tall figure is a nifty one. Ours are on the way, but why wait for Americans to review things when the Japanese already have awesome photos up? Check out a gallery of most of BS-20, the DX Starter Set, as well as Rynas. From the initial lump of clay to the product being in my house, a mere 3 weeks and change went by and I got a CyberGator head of my very own. 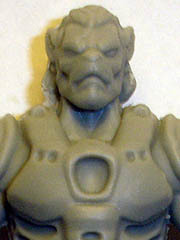 This head was sculpted by Jason Frailey (the guy who sculpted the Armorvor figure design) as an alternate head for that figure, but as of right now there are no plans to mass-produce it in PVC. 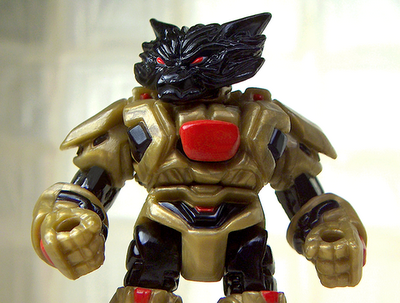 The GodBeast, a Glyos fan and amazing maker of toy things, cast the head and is now turning out some high-quality copies of the head, and the neck peg fits pretty perfectly in the Armorvor body as you can see. The catch? It comes unpainted, so if you don't have the equipment, skills, or expertise, it's basically a kit you'll never complete. 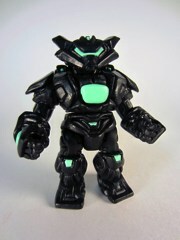 Unless you're crafty, in which case it's a great (if not cheap) add-on to one of the more fun Glyos releases of the year. 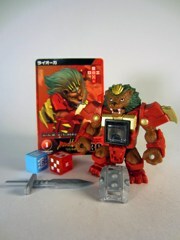 Behold, the Takara-Tomy Beast Saga Dice Arena BS-14! It's not very effective. Watch the video, and bonus points to you for clicking on the ads so I get a nickel. Thank you for watching! 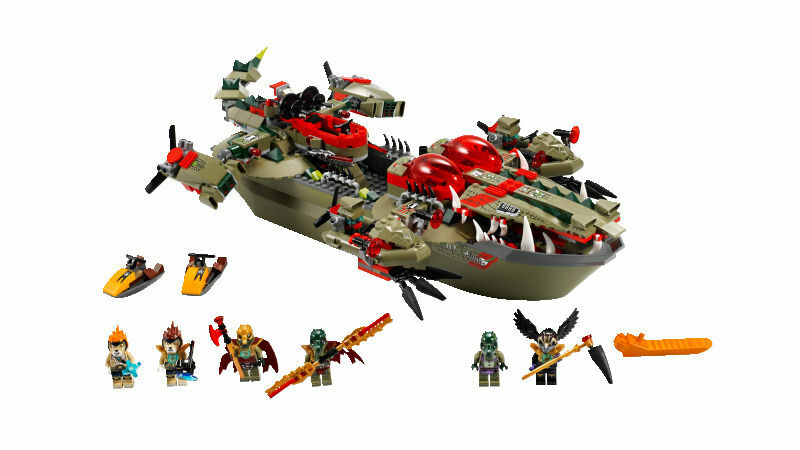 We've got a lot of Beast Saga stuff to post too, but first we wanted to talk about the all-new Legends of Chima, a new LEGO line in the vein of Battle Beasts... and Ninjago. The figures are creature-based with some nifty vehicle builds, many of which are animal-inspired much like the 1980s Battle Beasts chariots. You can see several figures and sets at Eurobricks. There's not too much variety in the figure species, but the vehicles range from so-so to mind-bogglingly compelling. Nifty! 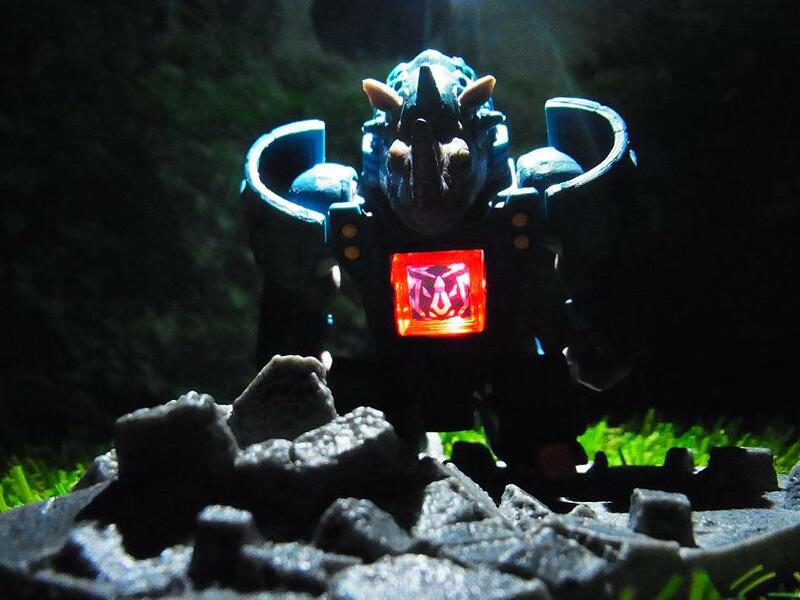 On eBay right now, you can see a swell Vorin Battle Beasts Minimates Custom Figure which has been painted up to look like the vintage Battle Beasts figure "Bighorn Sheep." Note the blue fur! Fantastic. I was wondering how one of these would look! It's up for sale right now, so be sure to click over to buy and/or check it out. Another quick sell-out for Armorvors! Onell Design posted Armorvor Spectre, Armorvor Veraxxan, and Armorvor Neo Nebula for $8 each last night with a limit of 1 per customer. The run sold through completely in about 12 minutes. A new, larger run of newly-decorated figures is slated for next month so if you missed these so far (there have been 6 to date), hold tight-- more are on the way! Friend of this (and other) site(s) Nik was kind enough to go to New York Comic Con, phone in hand, to snap about 66 great pictures of the Diamond Select Toys Minimates 10th Anniversary Display, which you can see on 16bit.com. 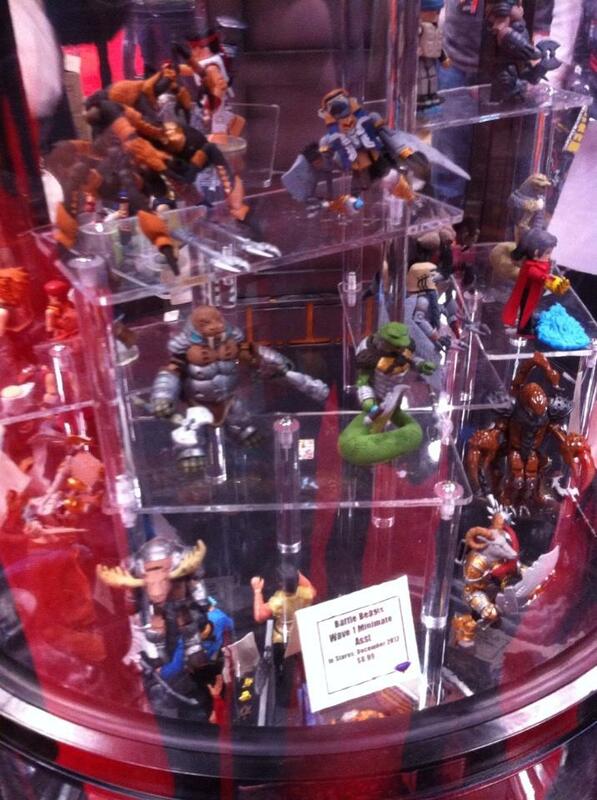 Friend of the blog (and all blogs, really) Nik fired off some shots of the Diamond Select Toys booth in New York from Comic Con! While no new characters (other than the moose) seem to be on display, you'll note the Scorpion, Tarantula, and Gruntos seem to have alternate deco and weapons! 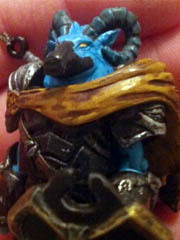 Vorin appears to be done up in his metallic paint, too, which probably means we're seeing the Toys R Us versions. (I'm just working from pictures, facts I don't have handy.) We really haven't seen a lot of the figures' gear yet, so this is a most pleasant surprise. Diamond Select Toys sent us an email informing us of some exciting festivities in New York next week! We won't be able to make it to New York Comic Con this year (as we are on another coast due to business), but here's a rundown of what you may find when you hit them up at booth #2156! 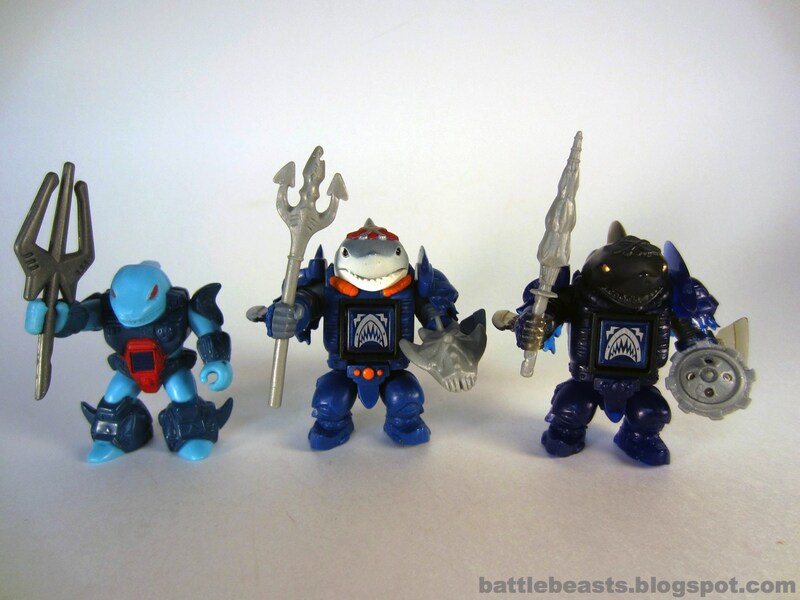 Battle Beasts Minimates panel Sunday, October 14 at 10:45 AM in room 1A06. 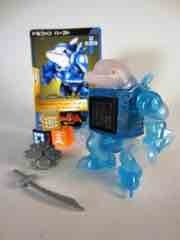 All child attendees (must be wearing a child badge) will get a free Battle Beast promo Minimates figure. "Located in room 1B02 of the Jacob Javits Center, the [Minimates 10th Anniversary Exhibit] will showcase Minimates, artwork and animation from throughout the line’s 10-year run, from their rock-and-roll beginnings at the NYC-based Art Asylum in 2002 to their multi-brand empire with Diamond Select Toys today. It will be open during Comic-Con show hours all four days, and attendees will receive one free promo Minimate from the company archives, while supplies last. (One per person for the weekend.)" More as we have it! 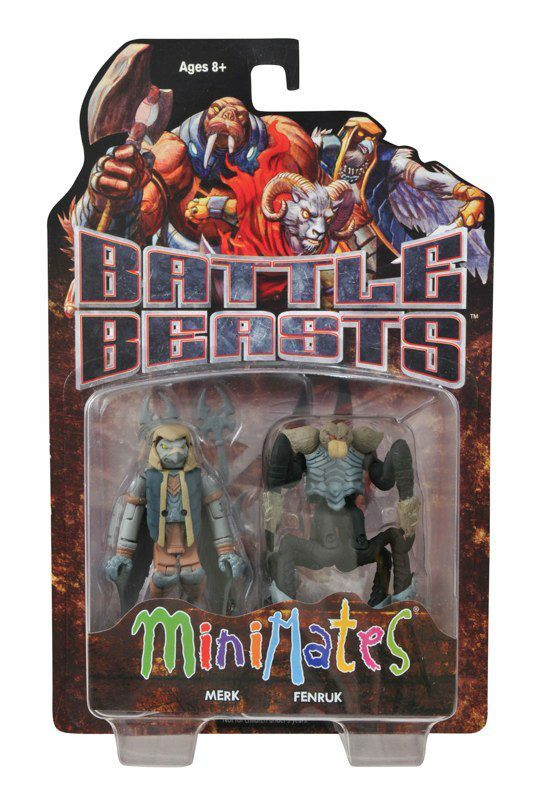 While it's a well-known fact that Diamond Select Toys will be cranking out some Toys R Us exclusive Battle Beasts Minimates in a few months, we haven't seen too many of them until Diamond posted a couple of them to Facebook. To the left, the (as-of-yet) unnamed Bat, which will come packaged with a companion Moose figure. Sadly depriving the world of a moose-and-squirrel set, these Beasts will both be exclusive to Toys R Us and from the look of things, ain't half bad. I mean, its got a sword! That's a plus. I dig the fangly dude. 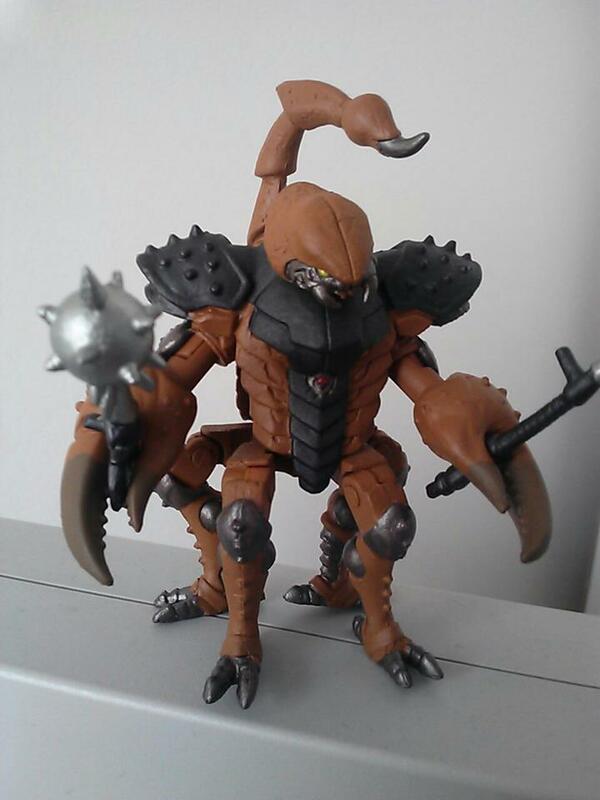 Also without a name as of yet for the character, this brown Scorpion will also be exclusive to Toys R Us, with the other version going to comic and specialty shops. It looks pretty fantastic in the up-close shot, and I'm happy to see critter mini-figures at the toy stores that aren't Littlest Pet Shop for once. ...having said that, LPS had an exclusive giraffe for the toy giant. 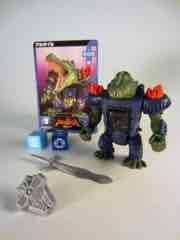 Here's hoping synergy strikes again and Diamond sees fit to make a Battle Beasts Minimates Giraffe for the chain! Great stuff, here, be sure to follow Diamond on Facebook for more stuff more often. The first one sold out quickly, and the Hades Mimic Armorvor (plus his clear companion) both sold out within minutes of their early September launch. Much like early Matty Collector figures, Onell Design has a few releases that basically require you make an appointment to be online to buy them. At least three more Armorvor figures are promised this year, so if you missed the ones featured here don't lose hope! 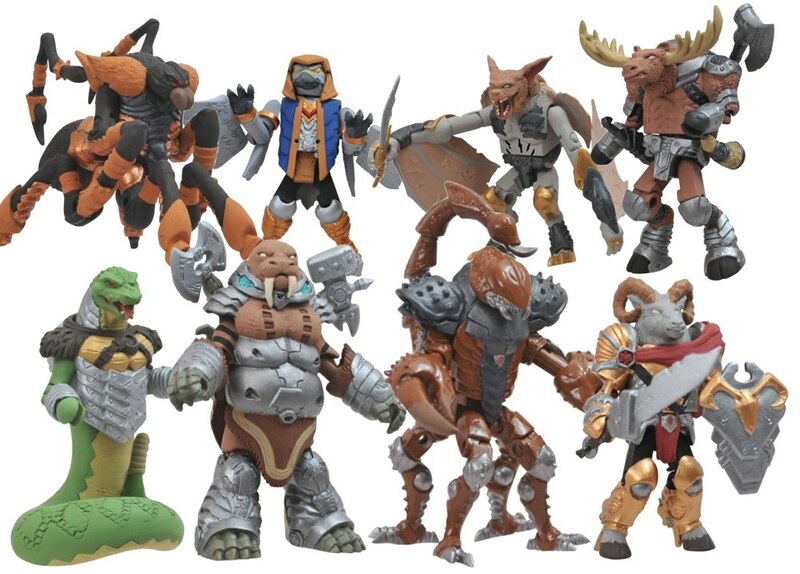 Despite a two-year lead in the marketplace, the new Battle Beasts line due later this year or early next year seems to be facing some stiff competition which makes it tough to pick a favorite. The Armorvor has made the rounds, and now so has Beast Saga with Raioga (or more likely Lioga/Lio-ga), a lion which has no fewer than 4 unique releases planned so far. So far, there's this one, one with niftier gear in a 3-pack, one in a capsule toy collection, and a blind-boxed clear version in burning "fire" colors which is pretty damn sweet. 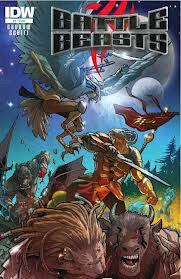 Issue #3 of 4 of the Battle Beasts comic book is in stores this week, so if you haven't picked yours up just yet, consider a trip to the neighborhood comic shop. Or perhaps someone else's neighborhood, if yours has no comic shop left. The blind box breakdown! Upon the toys' initial solicitation, the photographs lead us to believe that we'd get painted figures like a walrus in here. Well, those were wrong. Beast Saga BS-03 features clear, mostly unpainted repaints of figures from the single- and multi-packs, so those looking to collect one of each character could, in theory, skip these without guilt. Each blind box seems to be devoid of markings, and the interior packaging is ridiculous. The weapons, dice, figure, and trading card are each packed separately in black plastic opaque baggies. There are multiple cardboard chunks - in addition to an insert - which seem more than a little wasteful. Takara-Tomy went out of their way to make sure you can't guess which figure you get without cracking one open first. Here's what we found in our case, and this corresponds to others who also purchased a case. 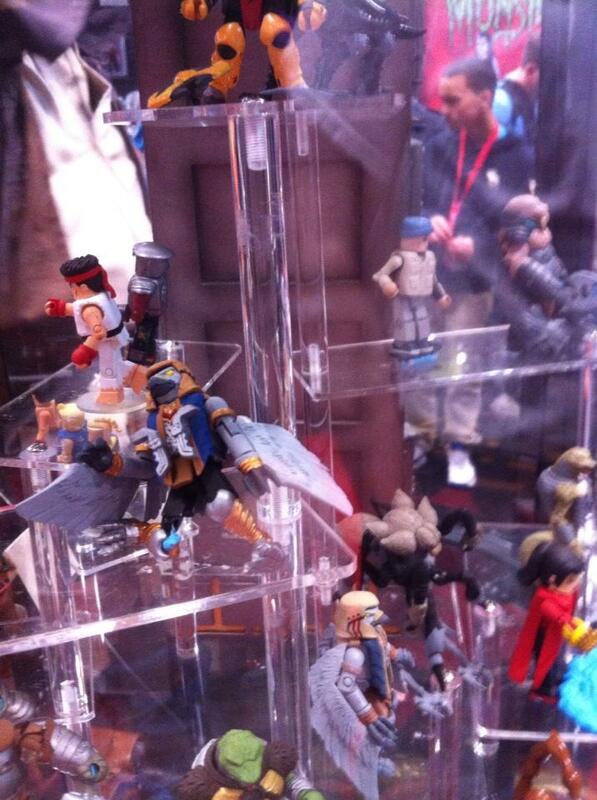 The clear figures appear to have nearly-identical accessories to the painted ones, save for the exceptions above. Same character face dice, but the "bonus" ones have other powers or numbers on them and may be random themselves. There are 2 kinds of chase items in a 24-piece case. 1:12 have a gold die, and 1:12 have a gold foil-bordered trading card. Interestingly, figures were sorted by layer-- so certain characters tended to cluster together. The top layer of the case included the 3 Dolphin figures, a bat, a lion, and a shark, which just happened to include all 4 chase pieces for those looking to cherry-pick. The bat had a gold die, the dolphin had a gold die, and the lion and shark each had a gold-bordered card. This is pretty consistent with what we're hearing from other collectors. The good news: there's no chase figures or chase weapons, just chase cards and bonus dice. The bad news: those of us who preordered with expectations of unique characters did not get any. And there's no sign of the walrus yet. 2012 seems to be the Year of the Beast! 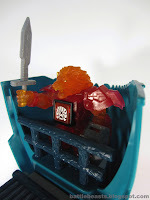 Since Toy Fair 2010 when we were endlessly delighted to see the very first Battle Beasts figure in decades from Diamond Select Toys, the big question was "what's next?" 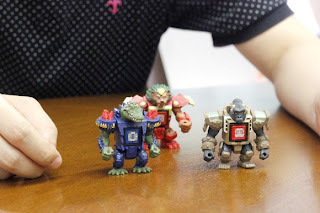 The roll-out of the Minimates has been slow and steady, giving other companies a shot at making similarly sized and themed figures of their own including Takara Tomy's Beast Saga which was released in Japan mere days ago. They're roughly the same size as Diamond's line, although much simpler with a significant reduction in articulation and deco. Still, they're pretty dang neat! 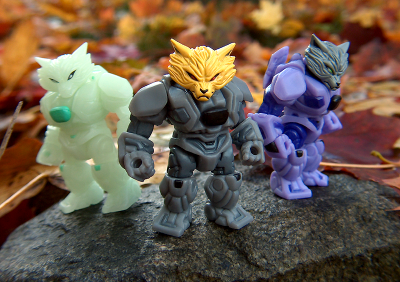 When it comes to size, it's really cool to see Takara Tomy's Beast Saga figures come in at about the same height as Diamond Select Toys' Battle Beasts Minimates. 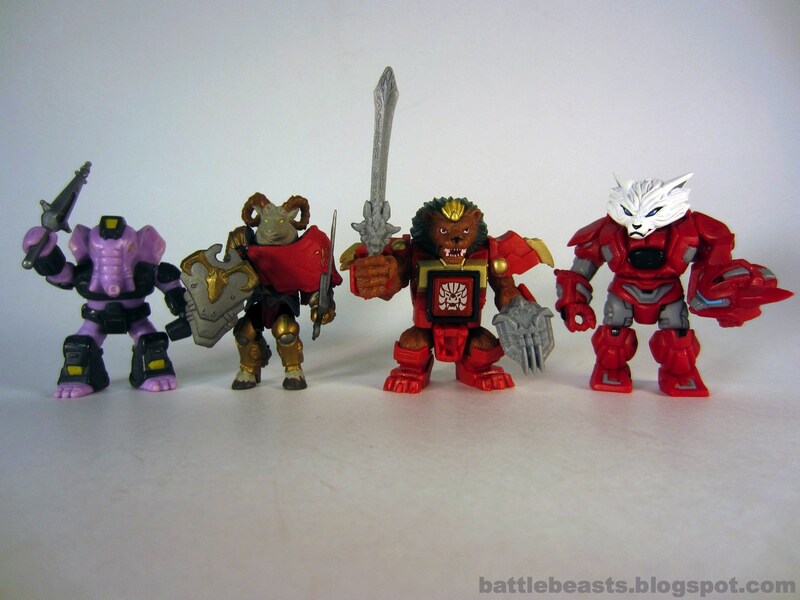 The Onell Design Glyos Armorvor is by far the largest figure by about a head, while the vintage Battle Beasts are about a head shorter. While Rise of the Beasts have yet to make their debut, we're hearing the final toys should be sized similarly to Beast Saga. 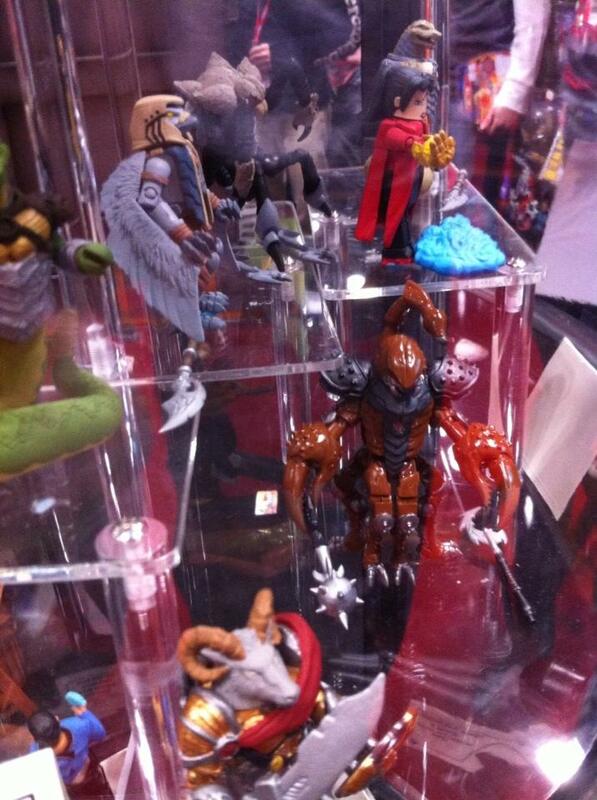 At launch, there are already over 20 figures in the main line plus 4 unpainted promotional unpainted beasts. 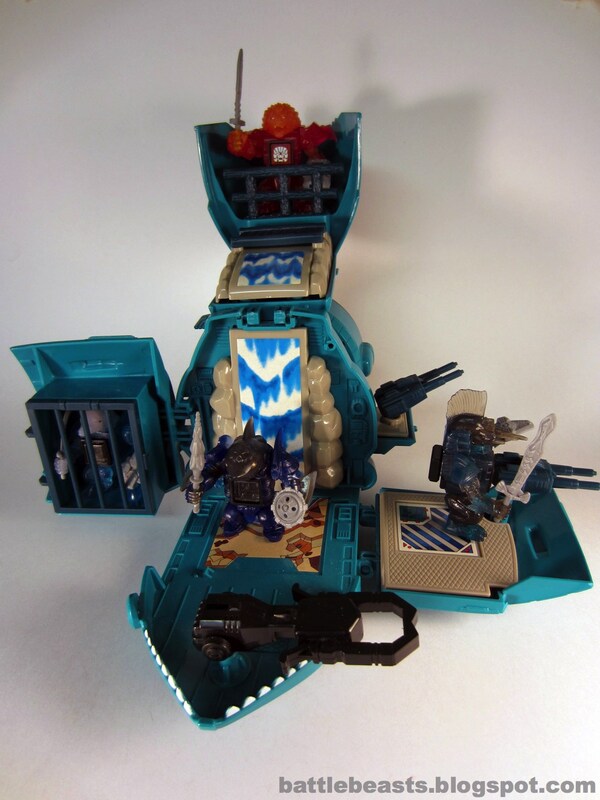 To the right, you can see a rundown of the sharks with the vintage Sawtooth Shark compared to Killer Shark from the Beast Saga 3-pack and his clear plastic redeco from the blind-boxed line. 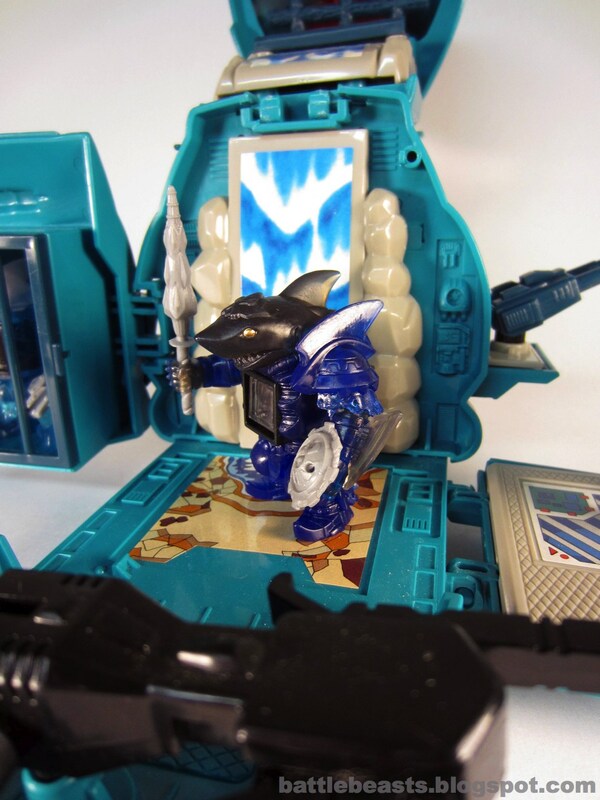 It's notable that the clear Raioga (Lion) and Killer Shark figures have different weaponry than their 3-pack counterparts, so there are some interesting differences between each version of these characters. While similar in size and aesthetics, these new beasts are larger. How big? Well, too big to be of much use on a vintage Battle Beasts Shocking Shark playset in most spots. You can see the dolphin fits in the cell just fine, but the bat and other bulky figures simply will not squeeze in that tight of a space. If you were like me and hoping Takara might dust off these old molds for a reissue, I'm not particularly hopeful it'll happen in the context of Beast Saga. 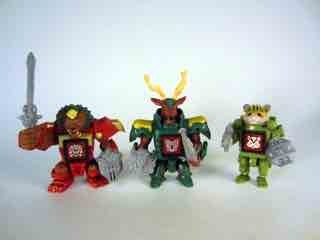 The biggest change between these and 1980s Battle Beasts would be articulation and a new game element. Long gone is the paper/rock/scissors game and sticker on the chest. These have been replaced by dice and a launcher. Each figure has at least 2 dice, while the blind-packed guys sometimes come with a bonus "chase" yellow die. The launcher is really nifty, and the same mechanism is in every figure. You can remove the launcher from the chest if you like, but doing so leaves an unsightly hole. There's no spring-loaded mechanism here-- it's kid power. If you push the plunger all the way in, the hole in the chest is filled but since it's clear plastic, you can see a hole of sorts in the torso. It turns out there's a good reason for this. 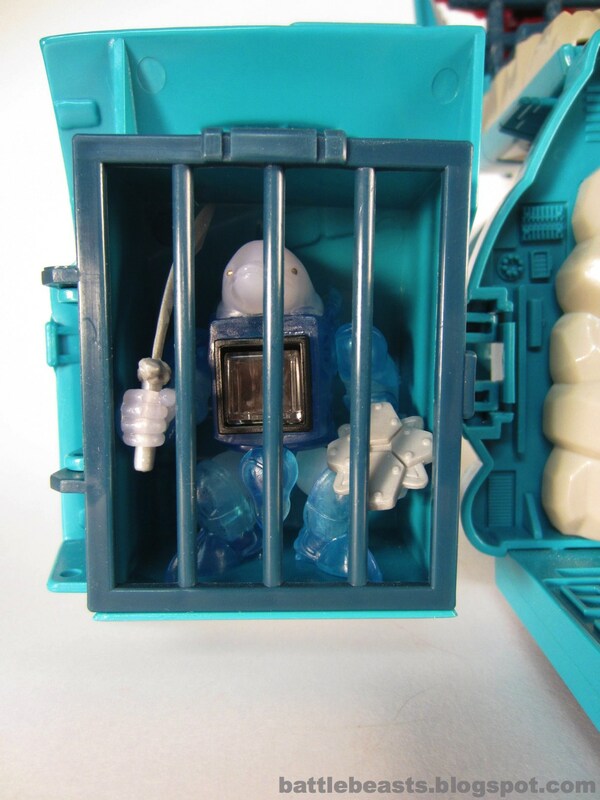 The rod is cast in clear plastic with a mirror strip in the back, meaning light can shine through the die in the chest and "light up" the logo in the figure's tummy. It's a simple, clever, and really brilliant little design... but that still means your figure has a big nasty mechanism in its chest. The other new addition is the hip articulation, which honestly doesn't add a heck of a lot. 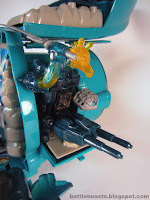 The clear elephant has looser hip joints, and while they usually don't hurt the figure any, the legs can't swing forward on most figures to allow them to fit in other, similarly sized vehicles. It's nice to have the option of moving legs, but they don't bring much to the table here and don't have the range of movement seen on Diamond's figures. I'm still photographing and opening figures as I write this, but I wanted to show you some early impressions in case you were considering getting these. Each unique beast line has its own pros and cons (not the least of which is customization and availability), but if you've got a few bucks to blow and don't mind dealing with Japanese instructions these are pretty neat. If I were you, I'd suggest hopping on the 3-packs first as they're pretty cool for the price. Rise of the Beasts: An Update! Originally pitched as a Kickstarter line, Rise of the Beasts has experienced a few delays since debuting online earlier this year. "I should be sending 2 of these to 80mm lions China for reference this coming week. They can use the two to make 1 articulated version to make the metal mold from." Hoorah! This is for the 80mm (closer to 3 3/4-inch) scale figure, and he sent in a message letting us know that work is indeed progressing on the smaller, 60mm figures. Progress! 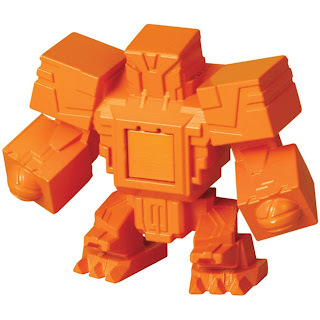 Not speaking the language, I have no idea what the name of this training golem figure thing with the BS-14 Beast Saga Colosseum is, but I saw the picture on Amazon.co.jp and thought you'd like to see it too. The set is pretty expensive for what you get, but if you're collecting the figures it might be worth your while to go ahead and track this one down. As we're still waiting for our box to show up, let's look to Japan again! 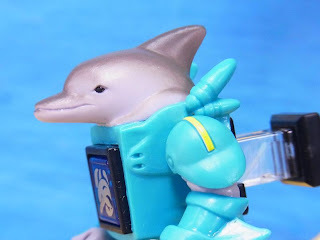 At this Japanese image sharing site, there are tons of nifty pictures of custom Dolphin figures with flamethrowers for reasons I do not understand at all. There's also the much more understandishable comparison of Pirate Lion, Raioga, and Transformers Bot Shots Optimus Prime. There's a good sense of scale! 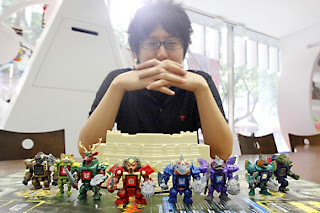 Another Japanese blog has a whole mess of shots of the Beast Saga Dolphin, or Dorufan, or whatever his name is. If you scroll down, you'll see not only shots of the toy, you'll see some more customizations and a spliced-apart figure which reveals the reportedly Glyos-compatible (but not really purely Glyos) pegs, so some part-swapping might be possible. Also, if you're impatient and/or have lots of money, check out this eBay auction (which might be closed by now) for all 8 blind-boxed translucent figures for about $146. Which reminds me, I need to get some trading card sheets and a 3-ring binder for the cards! Being an American, it's no secret that linguistics are not my strong point. 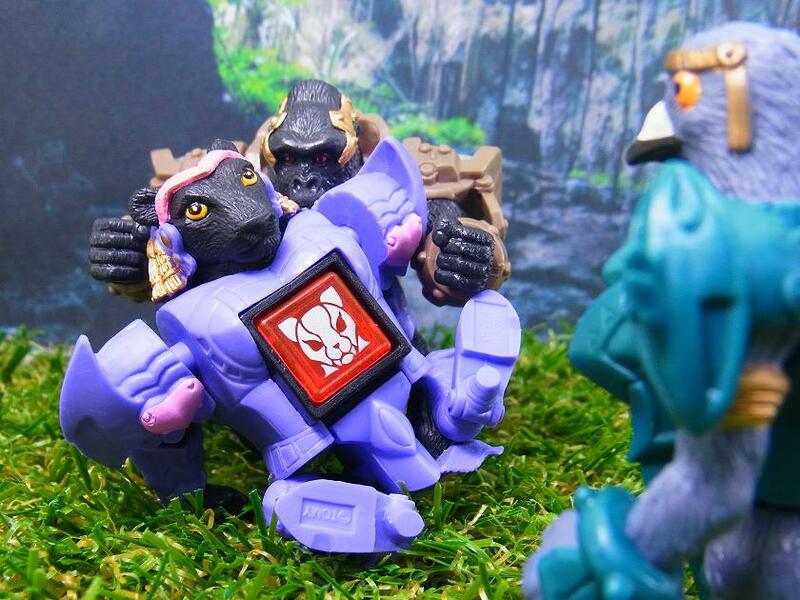 Thanks to the miracle of Google's translation services, we can all share in the joy that is Think about the animals you've got to figure became a battle "Beast Saga" animal pop?, an article over at Takara-Tomy which you can read in English here. Translation services have the dual benefit of helping us gain insight into another culture through the use of technology reducing the barriers of communication while completely screwing up context and cultural idoms. So Maybe the gorilla's name is Garrison G, and maybe it isn't-- but it's one of the many nifty things which I may or may not have learned in this article!